in this regard by the international community. ambassador to the UN, was quoted as saying by Fars news agency. removal of all WMD from across the globe. nuclear experts from 60 countries. Israel was the big loser in the nuclear review conference in New York – and Iran the big winner. in New York – and Iran the big winner. strengthening that some states wanted. regarded as a diplomatic defeat. weapons and to reconfigure US nuclear policy. named. Iran would have blocked the necessary consensus if it had been. It was ready to stop a consensus. The US was not. International Institute for Strategic Studies in London. recognised as a nuclear-weapons state, which will please South Korea. forthcoming, the US attitude towards further disarmament could well be affected. Russia and the United State as an example. The next NPT review conference is in 2015. 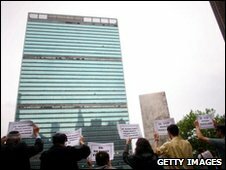 Posted in Uncategorized | Tagged: News and politics | Comments Off on Israel was the big loser in the nuclear review conference in New York – and Iran the big winner. eliminate unconventional weapons from the Middle East. states with nuclear weapons and those without too wide to bridge. peace in the region first, she said. support the document this year. failure of the conference to reach consensus. widespread consensus that it holds at least 100 nuclear missiles. nuclear weapons, which Tehran vehemently denies. compromise with Iran, to prevail on Tehran not to foil the agreement. Obama’s commitment to eliminate nuclear weapons. which is why the United States insisted in retaining a role as a sponsor. players found flaws in the outcome. It meant many steps had to be watered down. strong as the condemnation initially proposed. holding nuclear weapons but not nonproliferation treaty members, to join it. nonproliferation at the Monterey Institute of International Studies. doomsday arms from the Middle East. objectives of the 40-year-old NPT. questioned whether Israel could be persuaded to attend the conference. now in doubt," Jones said. hearty applause beneath the U.N. General Assembly hall’s soaring dome. Tauscher told the assembled delegates. nonproliferation steps as ratifying the treaty banning all nuclear tests. the cooperative atmosphere at the 2010 conference. disarmament and peaceful nuclear energy. "roadmap" for abolishing nuclear weapons. progress in 2014 in preparation for the 2015 NPT review session. the region into a zone free of nuclear and other mass-destruction weapons. conference but never acted on. U.S. diplomats discussed possibilities with Israel. which they were the only nation mentioned in this way, diplomats said. expressed support for a nuke-free Mideast. start of formal negotiations on a treaty. demanding the final document call for speedier disarmament moves. confidence in it by its performance in this review conference." positive measure by our delegation joining the consensus." negotiation is needed to avoid a slide toward conflict. emboldened, however, by what has been achieved in Tehran only days ago. and treatment of almost a million patients in Iran. Turkey, Brazil and Iran in Tehran on May 17 reflected a major breakthrough. broader negotiations with Iran in any place, including Turkey and Brazil. parties involved, including Brazil and Turkey. regretted for generations to come. explanation of my perspective and suggest a way ahead. Atomic Energy Agency (IAEA) Director General EIBaradei. would be no guarantee that Iran would ultimately agree to the final exchange. Iran from re-assuming control of its uranium at any time. dinner at the Islamic Center of York Region. The guest speaker? 9/11 conspiracy theorist Alan Hart. in final NPT conference resolution. Hawks in the United States and Israel appear set on "regime change" in Iran, pursuing a game plan similar to the run-up to war in Iraq, ratcheting up tensions while frustrating opportunities for a peaceful settlement. In the latest example, the New York Times on Tuesday published a leaked account of an order signed by U.S. Central Command chief, Gen. David Petraeus, expanding "clandestine military activity in an effort to disrupt militant groups to counter threats in Iran, Saudi Arabia, Somalia and other countries in the region." 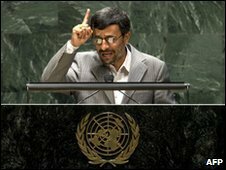 Iranian President Ahmadinejad initially supported the swap accord and agreed to a follow-up meeting on Oct. 19 in Vienna.